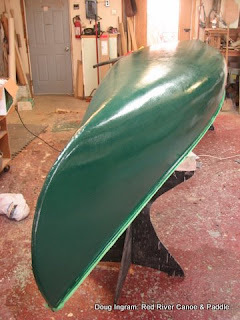 I don't know if its because I expect better results, or if its because this Interlux paint is so glossy, but this canoe has been difficult to get to look the way that I want it to. Shiny paint shows EVERYTHING! So what looks OK, is not so good when you look closer. Paint and sand, paint and sand, paint and sand. Fill with glaze compound, sand and paint, sand and paint. 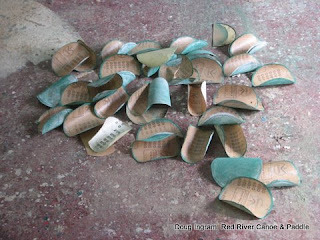 This pile of sandpaper is 400 grit and I used all of it to sand for the final coat of paint. 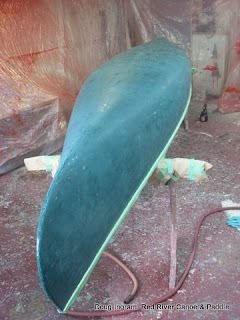 I decided to spray the final coat. I don't usually spray because its often so much hassle to set up. If I had a dedicated spray room I do it more often. But I don't, so when I spray I have to put up a plastic curtain to contain the over-spray and to keep out the dust. 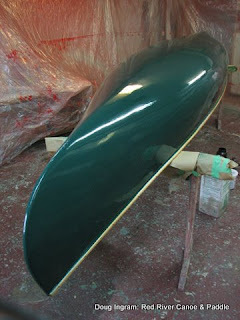 Final coat. 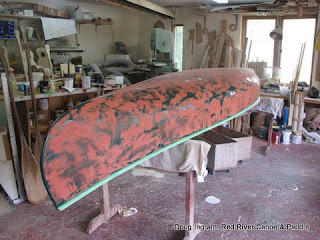 Best result of all the coats of paint on this canoe, but I still fret over how it could be better! I comfort myself with the knowledge that after it gets all scratched up no one will care. Posted by Doug Ingram at 9:42 p.m.